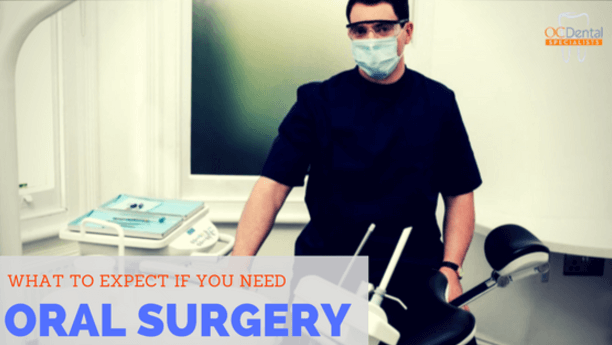 It’s common to feel slightly anxious when you learn that you need oral surgery. In most cases, people feel nervous because they don’t know what to expect or they imagine the procedure will be painful. At O.C. Dental Specialists, your comfort is our priority. Whether you’re having a tooth extracted, an oral tumor removed, dental implants installed, or another procedure, you can depend on the expert knowledge of your oral surgeon. You will know exactly what is happening and be provided with ongoing pain relief appropriate to your procedure. An oral surgeon is one of the most highly trained and skilled of the dental specialists. Four to six additional years of specialized training in oral surgery is required after completing four years of dental school. This advanced training consists of learning how to diagnose and treat disorders of the craniomaxillofacial complex. The American Dental Association recognizes oral surgery as one of nine dental specialties. Extraction of wisdom teeth is one of the most common types of oral surgery. Not everyone gets wisdom teeth, but those who do usually have them attempt to erupt between the ages of 17 and 25. It’s common to get all four wisdom teeth, although some people only have less. Wisdom teeth present a problem for most people because there isn’t enough room at the back of the jaw for them to come through properly. That means they must be removed. When wisdom teeth get trapped in the jaw due to lack of space, they can damage other teeth, cause an infection, or even cause a tumor to develop. Your oral surgeon first determines the degree of impaction and then begins to plan for your wisdom teeth extraction surgery. We provide you with aftercare instructions once the surgery is complete so you can heal quickly at home.